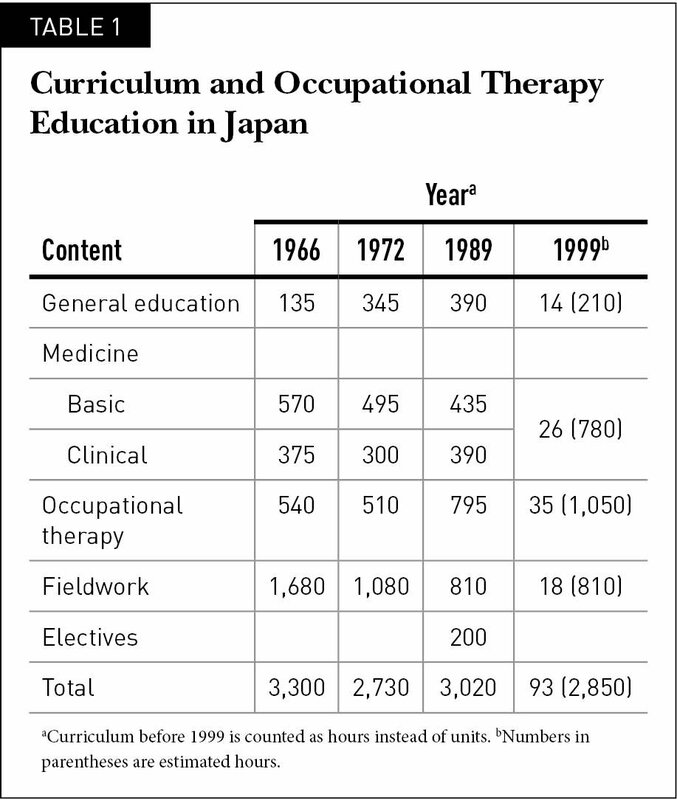 Occupational therapy in Japan has experienced more than a half-century of history. There are currently 80,000 occupational therapists in Japan. This number has increased rapidly for the past two decades, and the demand for occupational therapists remains high. According to the Japanese Ministry of Health, Labour and Welfare (2018), the population of Japan was 127 million in 2016. The average life span extends to 87.1 years for women and 81.0 years for men, one of the longest in the world. Japan has a large elderly population and a declining birth rate. However, Japanese occupational therapists are comparatively young, with an average age of 34.1 years. Japan is located in East Asia, along the Pacific coast, and is a chain of four main islands running north to south. The country includes several mountain ranges, with many active volcanoes and rapid rivers. It has a total land area of 378,000 km2, but only 30% of the land is suitable for agriculture, industry, and habitation (Japan Institute of Country-ology and Engineering, 2015). Because the habitable areas are mainly near the coast, the major cities have high population density. The climate of Japan is temperate, but varies greatly, from subarctic in the north to subtropical in the south. Japan is also known for its high prevalence of natural disasters, including earthquakes, tsunamis, volcanic eruptions, typhoons, and floods (Japan Institute of Country-ology and Engineering, 2015). These geographical conditions mean that each region of Japan has its own culture and lifestyle. Being an island nation has also affected Japanese culture: in some historical eras, Japan freely interacted with other countries, importing their knowledge and skills, whereas in other eras, Japan closed its borders and avoided interaction with other nations. For example, in the fifth through ninth centuries, Japan often interacted with China, and the Japanese written language was developed based on Chinese characters. However, from the 12th to 19th centuries, the warriors ruling Japan had much stricter isolation policies, especially in the last 200 years of that period. During that time, Japan nurtured its own culture, such as bushido (the warrior spirit), kabuki (a type of theater), and ukiyo-e (woodblock prints and paintings). When the country finally reopened its borders in the mid-19th century, Japan actively imported scientific knowledge and technology from Western countries, first Europe and later the United States, after Japan's defeat in the Second World War (WWII). Throughout all of these periods, Japan imported elements of other cultures and transformed them into something quintessentially Japanese. The same trend can be seen in the Japanese practice of occupational therapy. Although the field originated in the West, in Japan, the practice centers around cultural values that differ from those of Western nations, including valuing interdependence rather than independence, taking one's proper social position rather than asserting oneself as the center among others, and being an invisible power rather than an apparent power (Kondo, 2004). The concepts of uchi and soto (inside and familiar vs. outside and unfamiliar) are basic and unique cultural values that are used in occupational therapy. For example, Japanese occupational therapists subconsciously create uchi conditions for clients so that, as clients transition from their familiar occupational life, to soto, an unfamiliar life as a person with a disability, they can regain the uchi sense of familiarity through occupational engagement (Odawara, 2005). According to the Japanese Ministry of Health, Labour and Welfare (2018), in 2016, the population of Japan was 127 million. The average life span extends to 87.1 years for women and 81.0 years for men, giving Japan one of the world's highest life expectancies. In contrast, the annual number of live births has been declining, from 1.2 million in the 1990s to fewer than 1.0 million in 2016, resulting in a decreasing population. Within 15 years, Japan will have fewer than 120 million people (Ministry of Internal Affairs and Communications, 2016), and more than 30% of the population will be 65 years or older (Cabinet Office Government of Japan, 2017). Thus, Japan must confront the problem of having too few young, productive workers to support the growing aging population. Among these cultural and social factors, Japanese occupational therapy, as a health-related profession, is expected to greatly promote health at the individual, community, and population levels. The profession of occupational therapy in Japan began in the 1960s. However, even before this time, physicians in various specialties had integrated the use of occupation into healing (Akimoto & Tomioka, 1991). One of these fields was mental health, and occupational therapy in Japan is widely understood to have begun with patients with mental disabilities (Akimoto & Tomioka, 1991; Futaki, 2016; Kagaya, 2010a; Kamakura, 2012; Satomura, 2015). The psychiatrist Shuzo Kure was sent to Germany and Austria to learn psychiatric medicine in the early 20th century, a time when moral treatment, a humanistic approach to mentally ill patients, was employed in psychiatric hospitals. There, Kure studied beschäftigungs therapie (therapy integrating employment and a support allowance), and he began using the same practice when he returned to Japan, calling it sagyo ryoho, or a working/manufacturing remedy. He also taught sagyo ryoho to his students at the newly established national university in Tokyo. Psychiatrists who studied under him began to integrate various occupations into their positions at psychiatric hospitals. These included farming, gardening, animal husbandry, homemaking, repairing, stitching, and handcrafts. However, these practices did not spread, but rather ended when daily life was disrupted and living conditions deteriorated during WWII. Another strand of preprofessional occupational therapy occurred in tuberculosis sanatoriums. Until the mid-20th century, in Japan, tuberculosis was seen as a mortal disease (Akimoto & Tomioka, 1991; Futaki, 2016; Kagaya, 2010a; Kamakura, 2012; Satomura, 2015). A few physicians, again inspired by approaches from Germany, began advocating for occupational treatments, again calling these sagyo ryoho. During WWII, they were incorporated into treatment in military hospitals. In these settings, physicians carefully monitored patients in such occupations as graded walking and indoor and outdoor work. These strategies were not fully effective because of the shortage of physicians, medications, and food during WWII (Aoki, 2016). After the war, military tuberculosis sanatoriums became open to citizens, and national and private hospitals and sanatoriums were built. During the next two decades, tuberculosis was eradicated because of the expansion of sanatoriums, improved systematic approaches, increases in preventive care, and most significantly, pharmacological advances. Thus, occupational therapy gradually vanished in this area (Kagaya, 2010a). The third preprofessional type of occupational therapy was for people with physical disabilities, including children and disabled soldiers. Orthopedists used occupations such as crafting, sawing, typing, and playing games and sports to help patients to work toward social independence (Ueda, 2012). Those programs were called shokuno ryoho, or the ability to work to gain social independence. Because of the government's emphasis on the recovery of injured military personnel during WWII, these programs were most actively conducted at military hospitals. Although military bases and programs were demolished after WWII, these facilities eventually became civilian rehabilitation centers for people with physical disabilities (Omura, 1984). Earlier, physicians in various specialties had discussed the importance of engaging in appropriate activities to advance patients' dignity. Their ideas and practices, although not widespread at the time, had a significant effect on the foundation of occupational therapy in Japan, especially its medical orientation. The varied specialties of these physicians and their use of occupation as a medical therapy in different settings for different populations led to the polyphyletic nature of occupational therapy in Japan (i.e., originating from different sources and difficult to categorize together) as well as the vulnerability of the professional identity of occupational therapists. The movement to establish occupational therapy as a separate profession occurred after WWII. At that time, the government prioritized the recovery of Japanese citizens and the restructuring of the social welfare system (Ministry of Education, Culture, Sports, Science, and Technology-Japan, 2010; Suzuki, 1986). Japan joined the World Health Organization (WHO) in 1951 and began to send inspectors (Japanese government officers and physicians) to WHO-affiliated countries and invite foreign WHO inspectors to Japan. As a result, Japan recognized that it had insufficient medical rehabilitation facilities and that it needed to develop occupational therapy and physical therapy (Haga, 2010; Kagaya, 2015; Omura, 1984). With help from physicians and government officials, the first school of occupational therapy, the Rehabilitation School attached to National Tokyo Hospital, was established in 1963 under the Ministry of Health and Welfare (later the Ministry of Health, Labour and Welfare). Before the first students had graduated, the Physical Therapists and Occupational Therapists Act (1965) secured the professional status of occupational therapists. In 1966, the first national examination was held and the first 20 occupational therapists began their practice. In the same year, Japan issued Designation Regulation for Schools of Physical Therapists and Occupational Therapists, and other occupational therapy schools were established around the nation. Thus, the Japanese government acted swiftly to establish this profession throughout the country. From the beginning, medical perspectives have been ingrained in Japanese occupational therapy education. As shown in the Table 1, in 1966, occupational therapy students took twice as many medical classes as occupational therapy classes. Haga (2010), one of the physicians who developed this curriculum, recalled that administrators wanted students to have sufficient medical knowledge to be easily accepted by other medical professionals, including physicians who, with no knowledge of occupational therapy, were not initially inclined to accept the members of this new profession. For this reason, curricula emphasized medical perspectives in occupational therapy classes and fieldwork. Faculty members and fieldwork supervisors often came from other countries, especially the United States, which at the time, also emphasized the medical model of occupational therapy (Kielhofner & Burke, 1977). Thus, medical approaches provided the basis for occupational therapy education, and they still heavily influence current practice through the curriculum, the contents of the national examination, and textbooks written by the vanguards of Japanese occupational therapy, all of whom received their education during this initial period (Kondo, 2004; Odawara, 2005; Sato, 1995). Today, the Japanese Association of Occupational Therapists (JAOT) oversees the development of occupational therapy in Japan. This organization was founded on September 25, 1966, as the first professional group for occupational therapists in Japan. Today, it is the largest national organization of occupational therapists in the world (World Federation of Occupational Therapists, 2016b), with 54,957 members (Japanese Association of Occupational Therapists, 2017)—approximately 70% of the registered occupational therapists in Japan. Members started publishing the Newspaper of the Japanese Occupational Therapists Association and held the first Japanese Occupational Therapy Congress the year the organization was founded. In 1972, JAOT members acquired full membership in the World Federation of Occupational Therapists (WFOT), and in 1974, the National Health Insurance started to provide reimbursement for occupational therapy services. The Ministry of Health designated JAOT as an incorporated association in 1981, and the association published the first volume of its official research journal, the Japanese Journal of Occupational Therapy Research, the same year. Since its founding, JAOT has grown its membership and standards have been established, but it has also faced countless challenges, including criticism from other professions and an uncertain professional identity. For example, in 1974, Japanese psychiatrists came out against reimbursement for occupational therapy services. They argued that the services provided by occupational therapists (use of daily activities as therapy, including decisions about what patients do every day, monitoring patients, and charging medical fees) violated patients' freedom in daily life and work choices (Kamakura, 2012). The next year, at the 1975 Ninth Japanese Occupational Therapy Congress, physicians were invited to address the question, “What is occupational therapy?” Their critical comments reflected their polyphyletic voices, each representing a different area of practice, and their belief that occupational therapy should more closely resemble their medical practice. Consequently, professional identity became an issue for further discussion by Japanese occupational therapists (Japanese Association of Occupational Therapists, 1991). In 1985, JAOT (Japanese Association of Occupational Therapists, 2016a) presented its own definition of occupational therapy: “to provide treatment, supervision, or care to those who have or may have physical and/or mental disabilities, for the purpose of gaining an active life, through occupations which facilitate, restore, or develop functions” (p. 49). Despite the presentation of an organizational definition, the uniqueness of the profession was not fully recognized from outside or inside the profession. Thus, further questions about occupational therapy and professional identity—“what we do” and “who we are”—continued to be discussed at the Japanese Occupational Therapy Congresses in 1986, 1987, and 1989 (Japanese Association of Occupational Therapists, 2016a). Despite being unable to reach full agreement about professional identity, JAOT began to structure a knowledge base for occupational therapy by publishing a series of 13 textbooks, beginning in 1990 (Kagaya, 2010b). They also presented 10-year strategic plans in 1983, 1991, and 2001 and 5-year strategic plans in 2008 and 2013 (Japanese Association of Occupational Therapists, 2013), and they published guidelines for occupational therapy in 1991, 1996, 2002, and 2012 (Japanese Association of Occupational Therapists, 2016a). Further, to maintain the quality of occupational therapy practice, JAOT adopted a continuing education system in 1998 (revised in 2003), creating advanced certifications for occupational therapists and specialty certifications in areas such as assistive technology, hand therapy, and cognitive function. In 2011, JAOT appointed a representative assembly to effectively manage and administer the larger association and its members. Because the organization has reached its maturity, JAOT has taken an increased international role. In 2000, JAOT headed the 24th WFOT Council Meeting at Sapporo, and in 2014, JAOT headed the 14th WFOT Congress at Yokohama. Currently, JAOT activities include revising the organizational definition of occupational therapy; conducting discussions with the government to revise the Designation Regulation for Schools of Physical Therapists and Occupational Therapists (1966); facilitating “Management of Improving Daily Performance,” an occupation-based program conducted in community settings; and organizing disaster response practices. In 2016, Japan had 80,159 registered occupational therapists (Japanese Association of Occupational Therapists, 2017), the second largest number of any nation in the world and fewer only than the United States (World Federation of Occupational Therapists, 2016b). There are no governmentally recognized positions or certifications for occupational therapy assistants in Japan. Approximately 40% of occupational therapists in Japan are male, a higher percentage than in most other nations (World Federation of Occupational Therapists, 2016b). As stated earlier, the number of occupational therapists has continued to increase since the first group completed certification in 1966. 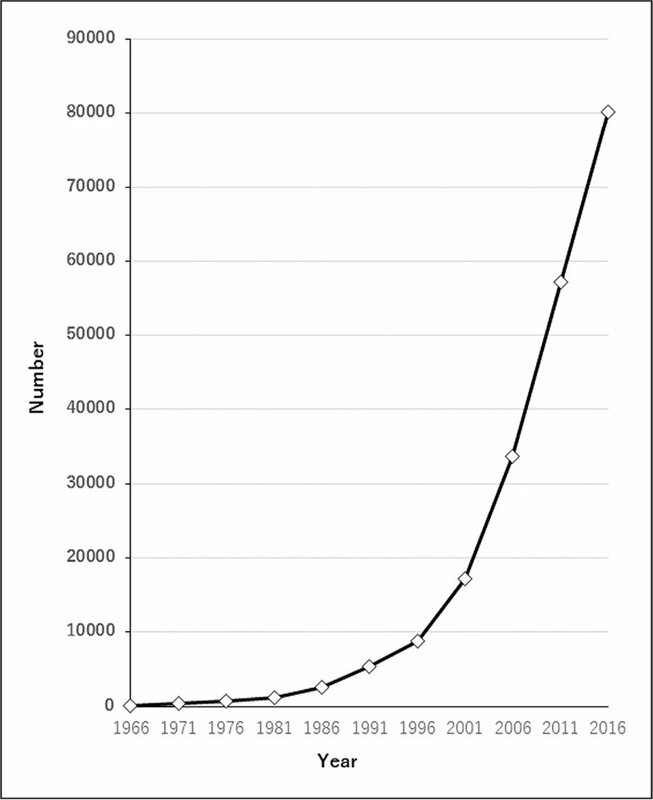 The number increased slowly at first, but with increases in the job market, the number has grown quite rapidly during the 21st century (Figure 1), as has the number of schools of occupational therapy. Despite the aging population of Japan, according to JAOT, the average age of JAOT members in 2016 was 34.1 years (Japanese Association of Occupational Therapists, 2017). More than 40% of the members were 30 years or younger, and 80% were 40 years or younger (Figure 2). These figures likely also reflect the age of Japanese occupational therapists in general because almost 70% of occupational therapists in Japan are members of JAOT. It is typical in this field to see young leaders working as administrators and managers of dozens of occupational therapists while simultaneously being challenged to foster their own occupational therapy practice. Number of occupational therapists in Japan. Age and gender of Japanese occupational therapists in 2016. N indicates the members of the Japanese Association of Occupational Therapists. In Japan, occupational therapy is highly controlled by health care regulations and laws (Iwase, 2010). Japan has two major public health care systems related to occupational therapy: the National Health Insurance Act (1958), which requires all Japanese residents to obtain public health insurance, regardless of age, citizenship, or employment; and the Long-Term Care Insurance Act (1997), a separate health care insurance system for older Japanese residents that requires people 40 years and older to participate. Both systems provide reimbursement for occupational therapy because it is considered a rehabilitation service. The National Health Insurance System is administrated by the Japanese government. Although it is basically supported by insurance fees, individuals' copayments for medical services and federal and local taxes are also used to maintain the system. Health care services are uniform throughout the nation, and the Ministry of Health, Labour and Welfare determines the cost of services, revising the system every 2 years to reflect changing social and economic conditions (Sakoi, 2016). Services are itemized by service time, type of disability or illness, time from onset, client age, and space and capacity of facilities (Iwase, 2010). The system and itemization of services have become increasingly complex in the past few decades because of the enormous expansion of medical services and political attempts to control costs. The Long-Term Care Insurance system is a combination of medical and welfare services and provides community and societal support for elderly persons as an alternative to traditional family care (Ministry of Health, Labour and Welfare, 2016). With this system, persons who are 65 years or older are eligible to receive health care services, such as rehabilitation services at home, rental of assistive devices, participation at adult day care centers, stays in short- or long-term care facilities, or residence in nursing homes. These services are selected by the elderly persons themselves or by their families (in consultation with care managers), according to their difficulty performing daily activities. With both systems, occupational therapists facilitate client independence in daily living by expanding participation in activities, promoting employment, selecting and adjusting assistive devices, facilitating adjustment to the environment to increase participation, and reducing difficulties caused by developmental or cognitive disabilities. Particularly for elderly populations, occupational therapists are expected to actively promote a higher quality of life by enabling engagement in meaningful activities, providing consultation with service vendors, smoothing transitions between facilities and residences, and participating in integrated community care (Japanese Physical Therapy Association, Japanese Association of Occupational Therapists, & Japanese Association of Speech-Language-Hearing Therapists, 2017). According to JAOT (Japanese Association of Occupational Therapists, 2017), approximately 75% of its members work in facilities that serve Medical Care Act patients, including general medical facilities, medical rehabilitation centers, psychiatric and children's hospitals, and various clinics (Figure 3). Another 12% of JAOT members work in settings that provide care under the Long-Term Care Insurance Act, including long-term care centers for the elderly, adult day care centers, and short- and long-term admission facilities. Work settings of Japanese occupational therapists in 2016. N indicates the members of the Japanese Association of Occupational Therapists. Another 6% of JAOT members work in social welfare, such as in assisted living facilities as well as counseling centers for elderly persons or children with disabilities (Japanese Association of Occupational Therapists, 2017). However, although the significance of occupational therapy is recognized in welfare acts, such as the Service and Supports for Persons with Disabilities Act (2005), the Child Welfare Act (1947), and the Act on Social Welfare for the Elderly (1963), the reimbursement system in these areas has not yet been fully established, perhaps because of a historical emphasis on medical care over welfare in Japan. The government recently emphasized the need for integrated community support systems for the elderly and disabled, and JAOT encourages occupational therapists to work in a community setting. However, the number of occupational therapists in long-term care and community settings is still low. To expand occupational therapy in these areas, recognizing the effectiveness of occupational therapy is crucial both inside and outside the profession. Further emphasis is needed on occupational therapy education, clarification of evidence, and political appeal. Figure 3 shows that more than 60% of JAOT members work in facilities for persons with physical disabilities, fewer than 20% work with elderly persons, approximately 14% work with persons with psychiatric disabilities, and 4% work with people who have developmental disabilities (Japanese Association of Occupational Therapists, 2017). Although the number of occupational therapists has been increasing overall for the past 10 years, the greatest increase has been in the number of occupational therapists working with people with physical disabilities (Act on Social Welfare for the Elderly, 1963; Japanese Association of Occupational Therapists, 2017), despite the demand for other types of occupational therapists, particularly in community settings for elderly people. The government registers and licenses all occupational therapists in Japan. Occupational therapists are required to pass a national examination that is conducted annually by the Ministry of Health, Labour and Welfare. Those who pass the examination are then certified as permanently registered and licensed occupational therapists, and no renewal is required. Most candidates who take the examination complete the minimum 3-year educational program at a government-designated school for occupational therapy. Physical therapists who complete a 2-year occupational therapy program or occupational therapists who are educated in another country and have had their education approved by the Ministry of Health, Labour and Welfare can also take the national examination. Because occupational therapists and physical therapists are secured and regulated under the same act and both professions share the same systems for education and certification, the professions have equal status. As with most other medical professions, opening a private practice is not allowed in Japan. Occupational therapy education is regulated by the Physical Therapists and Occupational Therapists Act (1965) and the Designation Regulation for Schools of Physical Therapists and Occupational Therapists (1966), both issued by the Ministry of Health, Labour and Welfare and the Ministry of Education, Culture, Sports, Science and Technology-Japan (MECSST). These statutes regulate the minimum period of education as well as other requirements, such as the hours and content of curricula and the qualification and number of educators, space, equipment, and tools. Although these laws are jointly issued, the schools designated for occupational therapy education by each ministry are administered separately. The Ministry of Health, Labour and Welfare oversees 3- and 4-year specialized training school programs, and the MECSST oversees university and junior college programs (Iwase, 2010). In 2016, Japan had 197 occupational therapy programs. Of these, 60% (n = 115) were under the oversight of the Ministry of Health, Labour and Welfare and 10% (n = 23) were public. Although the governing ministries and academic levels are different for the different educational categories, remuneration and the title of occupational therapist are the same. The occupational therapy training system was originally established by the Ministry of Health and Welfare (known as the Ministry of Health, Labour and Welfare since 2001) in the 1960s. During the first two decades, all programs were 3 years long and were conducted at specialized training schools designated by the Ministry of Health and Welfare. In 1979, in response to a demand from both inside and outside the profession for occupational therapy to be an academically degreed discipline, the Ministry of Education (MEC; known as MECSST since 2001) assumed oversight of education. Such training began at junior colleges, and students received an associate's degree. The first university-based occupational therapy program under MEC began at a national university, Hiroshima University, in 1992. In 1996, Hiroshima University started a master's degree program in occupational therapy and began offering a doctorate in 1998. Other undergraduate and graduate occupational therapy degree programs, certified by MEC, quickly developed. At the same time, 3-year programs in specialized training schools, as overseen by the Ministry of Health and Welfare, continued. Meanwhile, MEC programs that began as 3-year associate's degree programs offered at junior colleges gradually shifted to become 4-year bachelor's degree university programs. As a result, the 3-year programs over-seen by the Ministry of Health and Welfare became more popular among high school graduates and students who had a bachelor's or higher degree in another field, whereas 4-year university programs tended to be more popular among high school graduates matriculating for their first degree. The number of high school graduates is declining because of Japan's declining birth rate, whereas the number of occupational therapy schools remains consistent or is increasing slightly. This is a cause of concern because schools may lower admission standards to fill their seats, thereby lowering education levels. Upholding faculty standards is also a concern. Maintaining appropriate admissions in both programs will be important in the future. The school curricula are controlled by the Regulation for Schools of Physical Therapists and Occupational Therapists. The current curriculum divides occupational therapy education into the four categories of general education, medicine, occupational therapy, and fieldwork, with a total required minimum of 93 units (Table 1). The curriculum regulations have been altered three times in the past 50 years (in 1972, 1989, and 1999) in response to social changes. Over time, the number of occupational therapy classes has gradually increased, whereas the amount of fieldwork has significantly decreased. The current limited amount of fieldwork is problematic, however, because it is less than the minimum standard issued by the WFOT. Consequently, to receive WFOT approval, each school must create its own program that exceeds national standards. The new national regulation to resolve this problem has been discussed and will be issued in the near future. The designation of occupational therapy as a nationally certified medical-related profession has benefited practitioners greatly, not only through easier inclusion in health care systems but also by assuring occupational therapists' sense of professional security, reputation, and status. Meanwhile, there are also some disadvantages. For example, although many have argued for the contributions of occupational therapists in social welfare, such as support in employment transition and after-school day services (Japanese Association of Occupational Therapists, 2016b; Ministry of Health, Labour and Welfare, 2017), the application of occupational therapy in these areas is limited because of the requirement for medical supervision. Another issue concerns the difficulty of distinguishing occupational therapy from other medical professions, especially physical therapy. In the Physical Therapists and Occupational Therapists Act, occupational therapy is described as aiming to restore the ability of adaptive movements or the ability to adapt to society for people with physical and mental disabilities through arts, crafts, and other works. By contrast, physical therapy is described as aiming to restore the ability of basic movement for people with physical disabilities through exercise, massage, or physical modality (Physical Therapists and Occupational Therapists Act, 1965). These parallel descriptions have appeared repeatedly throughout history, as in the Designation Regulation for Schools of Physical Therapists and Occupational Therapists. The description in the act reflects the need in the 1960s to found medical rehabilitation professions rather than recognizing the historical and philosophical differences between physical therapy and occupational therapy. These parallel descriptions resulted in a combination of the two fields and a dichotomous division of work. They also led to a situation where occupational therapy was conducted after the acquisition of basic abilities via physical therapy. Thus, occupational therapy was seen as a secondary profession that followed physical therapy in medical rehabilitation. Defining both professions with the same statutes also led to difficulty in making adaptations, such as in the curriculum, because both fields must agree to changes. The existence of dual definitions of occupational therapy—one in the Physical Therapy and Occupational Therapy Act and another created by JAOT in 1985—is also problematic. Because the definition in the Physical Therapy and Occupational Therapy Act does not reflect the practices, social needs, and philosophical background of occupational therapy, JAOT created its own definition to eliminate some misconceptions. Despite the intention of JAOT to disseminate appropriate images of occupational therapy, the government description is still often used, increasing confusion about occupational therapy. The use of two very different definitions leads to vulnerability of professional identity and a lack of clarity in the profession of occupational therapy, despite its secured status. As shown by the large number of job opportunities for occupational therapists, the field is important in both Japanese health care and the broader society. To continue to meet the demand for this role, however, Japanese occupational therapists must develop a clear professional identity. In previous decades, occupational therapy in Japan shifted from a biomedical focus to an occupational focus, from using diagnostic labels to placing priority on health and well-being, and from concentrating on treatment to promoting health (Carswell, 2009; World Federation of Occupational Therapists, 2002). Today the field continues to emphasize the importance of occupations as a foundation for practice (Kronenberg, Algado, & Pollard, 2005; Kronenberg, Pollard, & Sakellariou, 2010; World Federation of Occupational Therapists, 2016a). To expand this concept beyond the medical model and implement occupation-based practice, it is essential to understand more fully the definitions of occupational therapy and the concept of humans as occupational beings. Better integrating occupational science into the professional curriculum and continuing education is key to supporting a unique professional identity among occupational therapy students and practitioners (Kondo, Nishikata, & Onishi, 2010; Yerxa, 1990; Zemke, 2016). In addition, the Japanese government must develop better educational systems based on occupation and revise its governmental statutes. Strengthening professional identity in this way will be particularly helpful for students and young occupational therapists, who may be confused by the variety of information available, the continuing prevalence of the medical model, and the shifting focus from hospitals to communities. Finally, in the future, occupational therapy education must integrate evidence-based practice, which has not been emphasized in the past. Because the professional status of occupational therapists was secure and reimbursement for service was guaranteed, little research was conducted on the effectiveness of occupational therapy in the field. However, because of the increase in medical costs and the need to encourage the shift from medically based approaches, data on the outcomes of occupational therapy are more important than ever. However, Japanese research on occupation-based practices in community settings remains scarce. Future research must not only examine the effectiveness of occupational therapy but also take a broader occupational science perspective, including the nature of occupations and occupational beings, cultural influences that affect community living, subjective experiences of health and well-being, and transactional processes between individuals and groups. Such work requires well-trained researchers working in transdisciplinary research teams. The results and the concepts clarified through research will guide future practice, particularly for occupational therapists in community settings. Because of the rapidly aging society and the growing number of elderly people, occupational therapists in Japan occupy a unique position. In an inclusive community— one in which people of all generations and genders and those with and without disabilities support each other to prevent illness and maintain health—occupational therapists can play an important role in meeting the changing needs of society. This article described how the practice of occupational therapy in Japan has been socially and historically shaped. Medical perspectives have been strongly ingrained in Japanese occupational therapy practice since the preprofessional stage before WWII. Thus, medical settings, such as hospitals, have been the center of development for occupational therapy in Japan. The Japanese government has also had a strong influence. The status of occupational therapists has been secured by law since the inception of the role, and education and certification have been regulated. Because occupational therapy services are incorporated into the National Health Insurance systems, reimbursements have also been influenced by the government. There is a wide range of choices for occupational therapy schools, such as specialized training schools or universities and public or private schools. Opportunities for advanced education have also increased. The work of JAOT has actively promoted occupational therapy and has contributed to the flourishing of occupational therapy practice in Japan. However, as the needs of Japanese residents change and as society ages, Japanese occupational therapists must transcend traditional medical perspectives and build a clear professional identity based on an understanding of occupation and occupational beings to widen practice areas, including community practice. Akimoto, H. & Tomioka, N. (1991). Shin sagyo ryoho genryu [New upstream of occupational therapy]. Tokyo, Japan: Miwa Shoten. Aoki, J. (2016). Nihonniokeru kekkakuryoyosho no rekishi to jikikubun ni kansuru kousatu [The study on period division of the history of tuberculosis sanatorium in Japan]. Senshu daigaku shakaikagaku nenpo, 52, 3–22. Futaki, T. (2016). Sagyo ryoho no genri [Principles of occupational therapy] (3rd ed.). Tokyo, Japan: Igaku-Shoin. Haga, T. (2010). OT.PT.no kyoiku [Education of OT and PT]. In Alumni Association of Tokyo byoin rihabiriteshon gakuin (Eds. ), [Closed down commemorative book “Seishi”] (pp. 180–185). Tokyo, Japan: Aipekku. Iwase, Y. (2010). Sagyo ryohoshi no yosei [Education of occupational therapists]. In Sugihara, M. (Ed. ), Sagyoryoho gairon [Introduction to occupational therapy] (3rd ed., Vol. 1, pp. 243–259). Tokyo, Japan: Ishiyaku-Shuppan. Japanese Association of Occupational Therapists. (1991). Sagryo ryoho no kaku [Core of occupational therapy]. Unpublished collection and review of symposiums. Japanese Association of Occupational Therapists. (2016a). Nihon sagyoryohoshi kyokai goju nenshi [50 years history of Japanese Association of Occupational Therapists]. Tokyo, Japan: Ishiyaku Shuppan. Japanese Association of Occupational Therapists. (2017). 2016 nendo nihon sagyo ryouhoushi kyokai kaiin tokei shiryo [Membership information and statistics of Japanese Association of Occupational Therapists in 2016]. Journal of Japanese Association of Occupational Therapists, 66, 6–23. Kagaya, H. (2010a). Nihon no sagyo ryoho no rekishi [History of occupational therapy in Japan]. In Sugihara, M. (Ed. ), Sagyoroho gairon [Introduction to occupational therapy] (3rd ed., Vol. 1, pp. 73–87). Tokyo, Japan: Kyodo-Isho. Kagaya, H. (2010b). Rihabiliteshon iryo no rekishi [History of rehabilitation medicine]. In Sugihara, M. (Ed. ), Sagyoroho gairon [Introduction to occupational therapy] (3rd ed., Vol. 1, pp. 63–72). Tokyo, Japan: Kyodo-Isho. Kagaya, H. (2015). Nihon no sagyoryoho: Kekkaku no sagyo ryoho [Japanese occupational therapy: Occupational therapy for tuberculosis] (2nd ed.). Tokyo, Japan: Medical View. Kamakura, N. (2012). Sagyo ryoho no sekai [The world of occupational therapy]. Tokyo, Japan: Miwa Shoten. Kielhofner, G. & Burke, J. P. (1977). Occupational therapy after 60 years: An account of changing identity and knowledge. American Journal of Occupational Therapy, 31(10), 675–689. Kondo, T., Nishikata, H. & Onishi, K. (2010). Sagyo ryoho gakusei wa sagyo kagaku wo donoyoni uketometaka: Shokugyoteki aidentiti ni oyobosu eikyo [How the occupational therapy students perceive occupational science: Influence to the professional identity]. Japanese Journal of Occupational Therapy Research, 29(2), 195–206. Kronenberg, F., Algado, S. S. & Pollard, N (Eds.). (2005). Occupational therapy without borders: Learning from the spirit of survivors (Vol. 1). London, England: Churchill Livingstone. Kronenberg, F., Pollard, N. & Sakellariou, D (Eds.). (2010). Occupational therapy without borders: Towards an ecology of occupation-based practices (Vol. 2). London, England: Churchill Livingstone. Omura, J. (1984). Rihabiriteshon to kankyo [Rehabilitation and environment]. In Sunahara, S. (Ed. ), Rihabiriteshon gairon [Introduction to rehabilitation] (Vol. 1, pp. 259–292). Tokyo, Japan: Ishiyaku Shuppan. Sakoi, M. (2016). Shinryo hosyu no shikumi to kaitei [The structures of medical fee and the process of revision]. Journal of the Japanese Society of Internal Medicine, 105(12), 2230–2329. Sato, T. (1995). Ima sagyo ryoho no bunyadewa: Sagyo ryoho riron no saiko [Occupational therapy: Review of theoretical foundation and present development]. Sogo Rihabiliteshon [General Rehabilitation], 23(4), 293–298. Satomura, K. (2015). Sagyo ryoho no rekishi [History of occupational therapy] (2nd ed.). Tokyo, Japan: Medical View. Suzuki, A. (1986). Nihon ni okeru sagyo ryoho no rekishi [History of occupational therapy education in Japan]. Sapporo, Japan: Hokkaido Daigaku Tosho Kanko Kai. Ueda, S. (2012). Showa junendai no rikugunbyouin ni okeru rihabiriteshon: Shoigunjin shuro heno michi [Rehabilitation casual military hospitals during the second half of the 1930s and the first half of the 1940s: The paths of employment for disabled veterans]. Shitennoji daigaku kiyo, 54, 131–155. Dr. Kondo is Professor, Department of Occupational Therapy, Faculty of Health Sciences, Kyorin University, Tokyo, Japan. The author thanks Ruth Zemke, PhD, OTR, FAOTA, Emeritus Professor, University of Southern California, for her encouragement, consultation, and editorial support with this article. Address correspondence to Tomoko Kondo, PhD, OTR/L, Professor, Department of Occupational Therapy, Faculty of Health Sciences, Kyorin University, 5-4-1 Shimorenjaku, Mitaka, Tokyo 181-0013, Japan; e-mail: tkondomtm@ks.kyorin-u.ac.jp.